AGUADA, PR – The Empire League system is not all about just playing baseball. 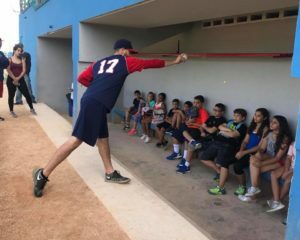 Its about building professional athletes to become the best they can be on and off the field while providing a fun, family oriented , positive entertainment for our families in our locations. These first couple of weeks have been outstanding in our communities as each team has visited either youth camps, hospitals, or ran clinics to inspire young children to stay in school, get involved in sports and provide a positive dream for their futures. The Puerto Rico Islanders Manager Tony Rodriguez with players Will Ramos, Luis Contreras and Willie Concepcion, got together with the Aguada Explorers manager Joey Molina and players Kyle Robinson, James Dockery, Terrell Thompson, Samuel Carter and Ryan Rivera, to provide a clinic for youth summer camps all around the Island. So far they have successfully provided knowledge, inspiration and created dreams for one of the 8 programs set up to visit. 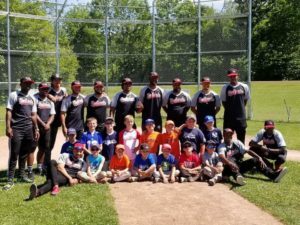 The Plattsburgh RedBirds have also had camps and clinics for kids in the Plattsburgh community and have done a fantastic job involving themselves with the youth in all aspects of life led by RedBirds leader Sandra Perry and 13 of the 20 rostered players who had a blast in the past weeks camp. 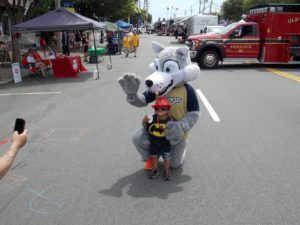 In Old Orchard Beach, our Mascot Surgio and front office staff have toured the entire city sharing memories, taking pictures and putting smiles on children and adults faces as they have been non stop providing their own donated time to entertain and expose the leadership roles these ball players take on every single day. These pictures show the character, love, passion for the game and involvement in the community that it takes to be a professional athlete. Here at the Empire Professional Baseball League, its not just about building a better baseball player, its about building an Empire! Building athletes into better people, involving the communities around us to create a fun, healthy, positive environment anywhere the league is around. On behalf of the Empire League executives we thank those players, coaches, staff and communities for your hard work and support in continuing to make our homes an enjoyable and positive place for our future generation.